This book explains how hypertension affects 20-50% of the adult population in developed countries. Heart failure is the result of the hypertension's effects on the heart and it represents a growing public health problem. In this context the international scientific community is continuously struggling to develop better strategies in screening, diagnosing and treating hypertension and its deleterious effects. Thus, this field is continuously changing, with new important information being added constantly. This volume will offer both insights into the intimate mechanisms of transition from hypertension to heart failure and clinical practice advice on the prevention and treatment of heart failure in hypertensive population. The mechanisms which explain the progression from hypertension to heart failure will be also covered exhaustively by offering two chapters referring to the diagnosis of heart failure in hypertensive population and one regarding echocardiography which is the most frequently used imaging method in clinical practice. The reader will be also provided with information on cardiovascular magnetic resonance which has the unique advantage of differentiating hypertensive heart failure from other pathologies associated with increased myocardial thickness. 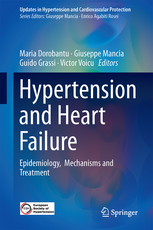 This book is a useful tool for clinicians but also to the research community interested in heart failure and consequences of hypertension on heart who want to be up-to-date with the new developments in the field.